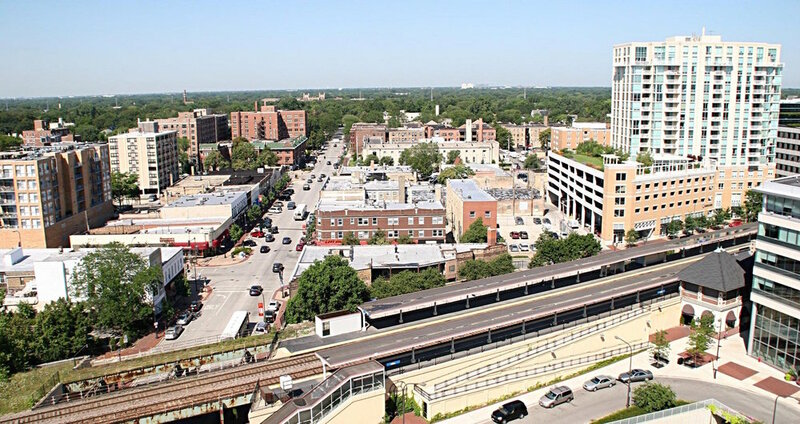 Downtown Evanston is the commercial center for Chicago’s North Shore, with one-of-a kind shops, diverse entertainment, incredible restaurants, offices and condominiums. The area has experienced unprecedented development and redevelopment within the last decade. New developments have included residential and retail components, resulting in the construction of nearly 4,317 condo units since 2000 and over 100 rental units. An additional 273 apartments will be available in spring 2019. In addition the downtown remains a workforce center, employing over 10,000 people and housing the World Headquarters of Rotary International and home to Accuity, Acquirent, ZS Associates and other major companies. Easily accessible via Purple line and Metra, many of the daily commuters use these systems as their main form of transportation to and from Evanston. Evanston is also conveniently located just 30 minutes from O’hare International Airport and 45 minutes from Midway International Airport, making Evanston attractive to regional and international travelers. Businesses are provided support by Downtown Evanston, which manages and markets the downtown district of Evanston. In addition, The City of Evanston’s Economic Development staff has created an economic development work plan that focuses on arts & entertainment, entrepreneurship development and growth oriented startups, as well as retail attraction and retention. These entities work together to ensure Evanston provides the infrastructure and vibrant economic environment businesses need to succeed. Current on street parking spaces in the downtown area is about 1200. There are five public use parking lots downtown. The Best Western (upper decks), underneath the Chase Bank (Orrington/Davis), 500 Davis, Benson/Clark and the Rotary Building. There are 3300 parking spaces in the three City owned parking decks. Per hour meter rates in the CBD is $1 per hour with some 20 minute meters scattered throughout. There are long term meters for commuters and employees at $.25 for 1.25 hours (12 hr. max). There is a 2 hour maximum time limit restriction on all meters with the exception of 39. The new single-head meter technology allows for payment with coin, credit card and by mobile app from Passport Parking. Evanston boasts one of the largest and most diverse arts communities in the state, among the multitude of galleries, museums, organization and live theaters. Click here to view a full list.